People are often surprised to learn that BOTOX® can be safely and effectively administered by their dentist. Call to schedule a consultation to find out if BOTOX® treatment is right for you. Dental BOTOX® can help lessen the appearance of fine lines and wrinkles such as frown lines, crow’s feet, and stubborn wrinkles between the eyes can make you look older than you feel. BOTOX® Cosmetic is the only approved treatment to temporarily improve the appearance of both moderate to severe frown lines between the brows and crow’s feet lines in adults. It is one of the most extensively studied medical aesthetic treatments and is approved for cosmetic use in 78 countries. With more than 10.9 million vials of BOTOX® Cosmetic sold in the U.S since 2002, millions of people have made BOTOX® Cosmetic something they do for themselves. Today, BOTOX® Cosmetic is the #1 selling product of its kind in the world. 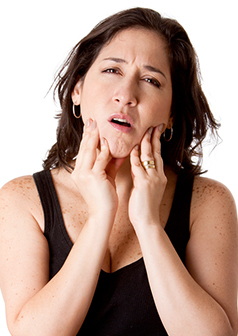 BOTOX® for PAin related to TMJ disorder, teeth grinding, or clenching. Though BOTOX® injections are best known for their cosmetic applications, BOTOX® can relieve painful dental conditions triggered by jaw muscles. BOTOX® can be an important therapeutic tool in TMJ treatment as well as other procedures to protect your teeth. Long before BOTOX® was used as a cosmetic solution to fine lines and wrinkles, it was used for medical purposes. BOTOX® injections relieve painful muscle spasms or muscle clenching. The results include a reduction in facial pain, teeth clenching, grinding, and headaches. Treatment usually lasts 3-4 months. If you are pleased with treatment outcomes you can maintain your results by having injections administered every 3-4 months. Treatments often takes less than 10-15 minutes and are minimally invasive. The procedure is essentially painless with the minimal complications. Results will be seen in 2-10 days.